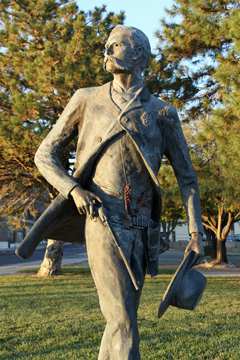 Several town site names in Greeley County have a connection to New York newspaperman, Horace Greeley. Horace is about two miles west of Tribune on K-96. In the early part of the 20th century, two different round houses of the Missouri Pacific line once stood in Horace. No evidence is left. Population is around 70. Many of the houses are extremely small. Were these for temporary railroad workers? Barrell Springs Hunt Club is thriving though as a lodging facility for hunters or non-hunters. Twenty-four bedrooms, each has a private bath. They offer a premier package for those looking for a great pheasant hunting experience. Some towns may not be at their best any longer but a drive around town will usually give some clues as to the story of the town. Boots, cowboy hats, and cattle. That's Dodge City! Boots, cowboy hats, and longhorn cattle. 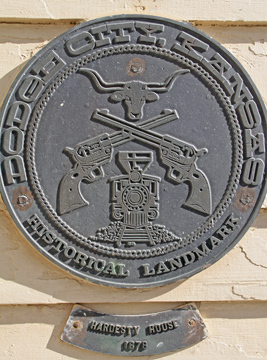 Symbols of the wild west days in Dodge City. 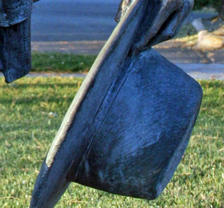 Now, in more permanent form, these items are historic and artistic icons of the city. Wyatt Earp (statue on left). Bat Masterson and brother Ed Masterson. All law keepers in Dodge City and Ford County during the 1870s. 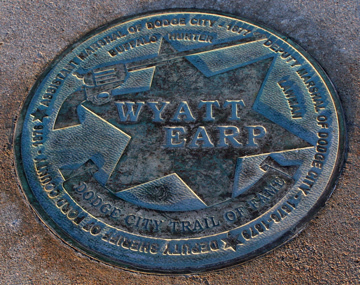 Today you'll find Wyatt Earp, along with others, patrolling the Trail of Fame. 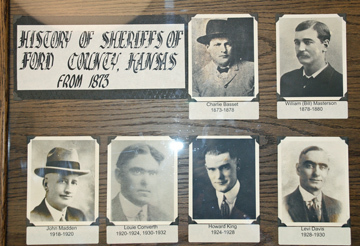 Step inside the courthouse to see pictures of county sheriffs, including Bat Masterson. This plaque about Bat's brother Ed is found at one of the little known but very explorer-y places to stop, the Bronze Bell Memorial at First and Soule, next to the fire station. 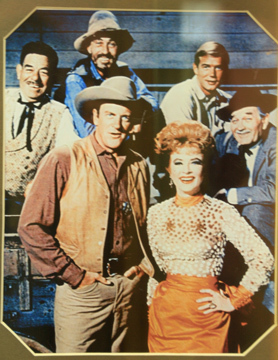 Heard of Matt Dillon, Miss Kitty, Festus, Doc Adams (born in Burtton, KS)? The Gunsmoke Room is one of the newer exhibits at one of the oldest tourist attractions in the state, Boot Hill Museum, Front Street and Fifth. 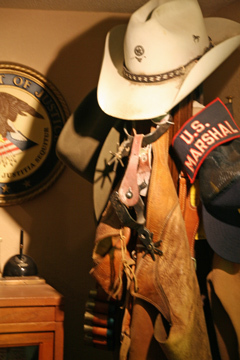 The Gunsmoke exhibit is a fun one for those who grew up watching the show that made Dodge City famous. 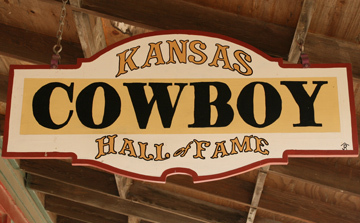 The Kansas Cowboy Hall of Fame, located within the Boot Hill Museum, tells the story through portraits and brief biographies about some of the real cowboys of Kansas. This group of statues at 4th and Spruce, to the east of a Mission-style building, may not be in the best condition but that might be what makes them so fun to discover. 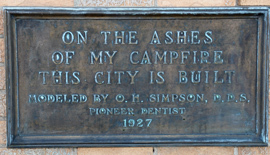 A 1927 statue of a cowboy stands above a plaque that bears these words: On the ashes of my campfire this city is built. 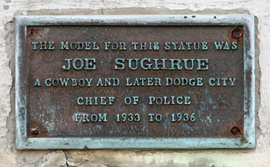 The model for the statue was Joe Sughrue, a cowboy and a Dodge City chief of police from 1933-1936. They plastered is whole body to make a mold and it nearly killed him. The plaque at this statue says: My trails have become your highways. 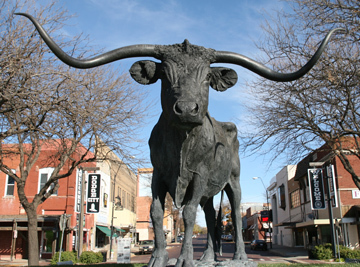 Seven million head of longhorn marketed from Dodge City 1870s-1880s. 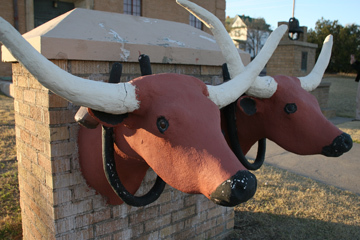 Dodge has great signage about all things historical, including the longhorns. But if you want to experience the modern-day cattle business in Dodge City, head to Winter Livestock sale barn, 1414 E. Trail. Just mosey on in and watch the cattle sale action from the bleachers. 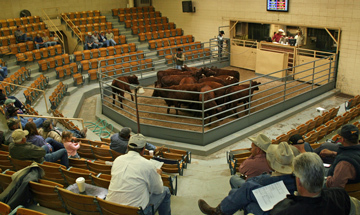 The sales are on Wednesdays at Winter Livestock Sale Barn. Don't wave your hand or you'll end up going home with a steer. 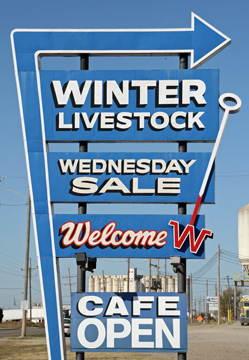 Winter Livestock was one of the 8 Wonders of Kansas Commerce finalists. 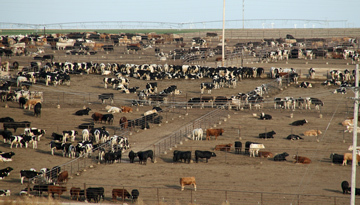 For those of you who don't see a giant feedlot every day, stop at the overlook on E. Business U.S. 50. Signage explains the feedlot business. Cemeteries hold so many stories. At the Maple Grove Cemetery (Matt Down Road) you'll find a GAR memorial across from the sexton's office. 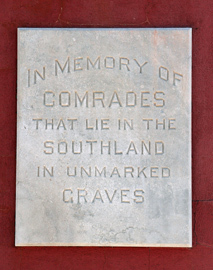 The Civil War plaque says: In memory of comrades that lie in the southland in unmarked graves. 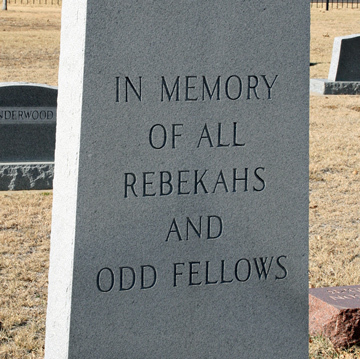 A "Rebekahs and Odd Fellows" memorial is also found here. The resting place for Chalk Beeson and other early names is here at Maple Grove. You'll have to keep your eyes open to find this marker. It's two miles west of the city limit on U.S. 50, north side of the road. 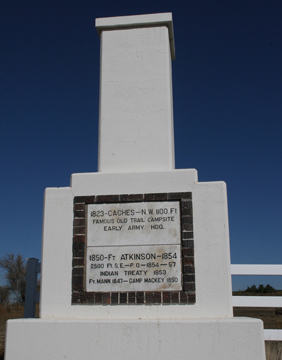 The marker tells about nearby caches left in 1822 and recognizes nearby early forts, Atkinson and Mann. Touching this marker gets you just a little closer to the history. The story is everywhere -- even on the street pole banners. Good job by BB Metal Arts out of Hoisington. The Wyatt Earp medallion is like others on the Trail of Fame. 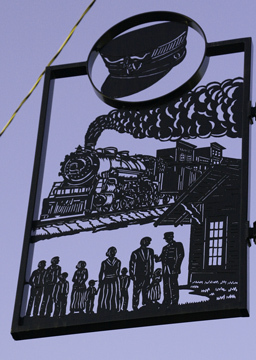 The landmark medallion is found on buildings deemed historical landmarks in Dodge. Are you interested in architecture? 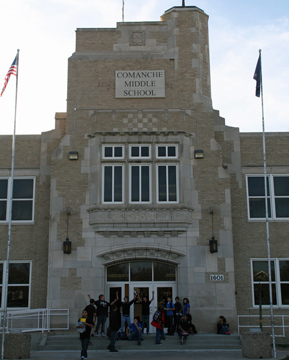 The present-day Comanche Middle School, 1601 First Ave.) has an art deco flair to it! It was built in 1928 and has been described as a modern "Collegiate Gothic" architecture. It's worth the time to stroll in front of the school with camera in hand. 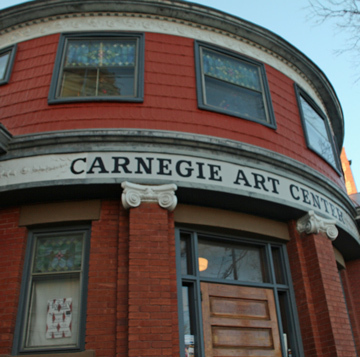 Built in 1907, this rare round Carnegie Library is now the Carnegie Center for the Arts, 701 Second. 620.225.6388. Want to go to a drive-in? There are only a handful left in the state. 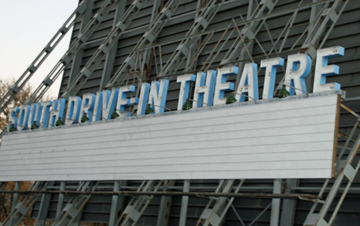 The South Drive-In is in Dodge at 1019 McArtor Drive. Find their schedule on Facebook. 620.225.4301. HAVE YOU EVER SEEN ANYTHING LIKE THIS? 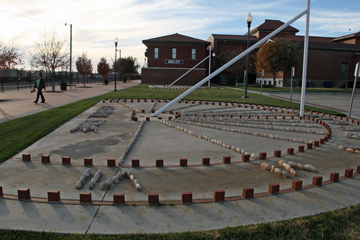 These are two giant 16' sun dials designed for the early-day railroad passengers coming out of Mountain Time Zone and into Central time, or vice versa. 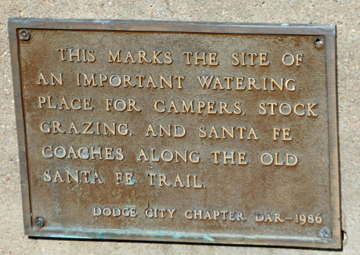 They are located just east of the historic 1898 Santa Fe Depot (Wyatt Earp and Central), the largest existing rail depot building in Kansas. See a theater production at the depot! 620.225.1001. 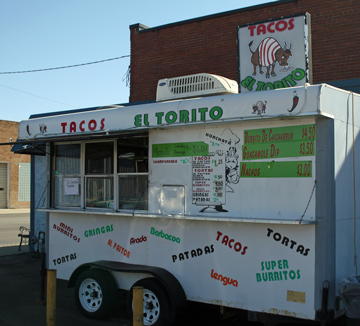 Where to eat, you say? Three places that we recommend for food and cultural flavor are Kates, 305 E. Trail (Monday-Saturday 11 a.m.-10:30 p.m.--get the fries), the Winter Livestock Sale Barn Cafe (open Monday-Friday 6:30 a.m.-2 p.m.--get the buttermilk pancakes) and the taco truck, Tacos El Torito, often found behind Leonard's Tire at 113 N. 2nd. You can spend days in Dodge! 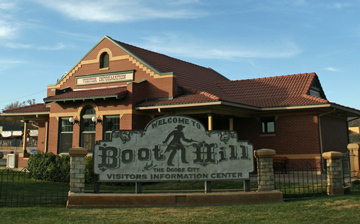 The Boot Hill Museum and activities could keep you busy for a day, including a stagecoach ride, Can Can lessons, a variety show, and more. Stop at the Kansas Teacher's Hall of Fame, the Gunfighter's Wax Museum, and the Wright Park Zoo, too. Feeling like a gambler? There's the Boot Hill Casino for you. 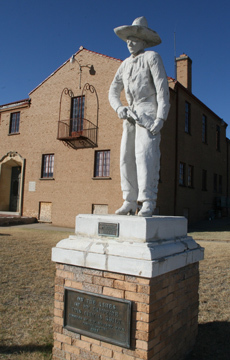 For more information about Dodge City attractions, go to visitdodgecity.org. 800.OLD-WEST. 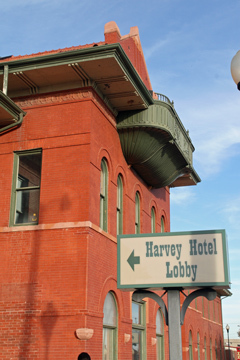 The visitors information center is at 400 W. Wyatt Earp. 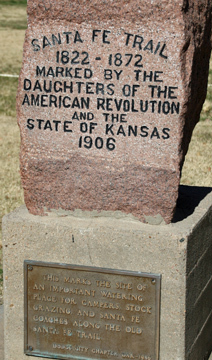 Marci and WenDee LaPlant of the Kansas Sampler Foundation are traveling to every town in the state to research for the next Kansas Guidebook for Explorers. Estimated due date for the book is Christmas 2015. 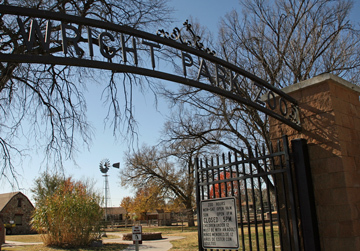 Dodge City's Wright Park is one of my favorite parks in the state. 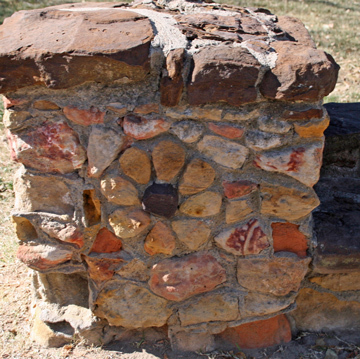 It has a small zoo, a band shell, an architectural gem, and many, many signs, plaques, and memorials. Robert Wright platted the park and Peter Mootz landscaped it in 1883. It's located south of Wyatt Earp Blvd. on Second Street. Thanks to DAR for marking this site. It was an important and valued stop along the Santa Fe Trail. 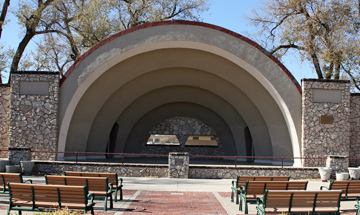 The Municipal Band Shell, home of the famous Cowboy Band, was built by the WPA in 1934. Some other signs and symbols: the horse pit and a reminder of the railroad. 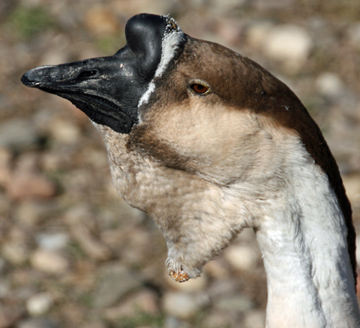 Wright Park Zoo, 130 4th Avenue, is open daily 9 a.m.-5 p.m. 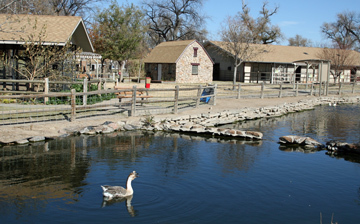 The zoo dates back to 1922 when the local Kiwanis club made plans for a bird refuge. The bear, kions, and buffalo came in 1926-28, establishing the zoo as one of the oldest in Kansas. 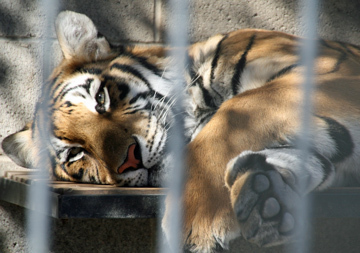 Elvira, the Bengal tiger, is a popular occupant. The duck pond is another favorite place. 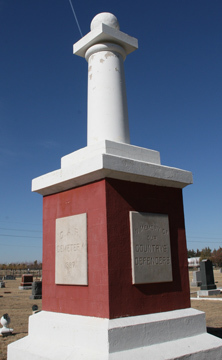 George Hoover, a four-term Dodge City mayor, died in 1914. He left $10,000 to build a public assembly room. 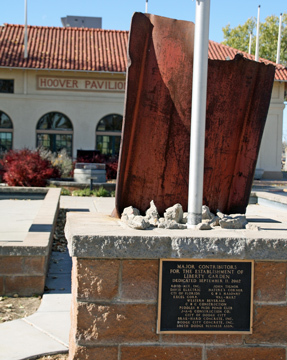 The result was Hoover Pavilion, located in Wright Park, built in 1919. 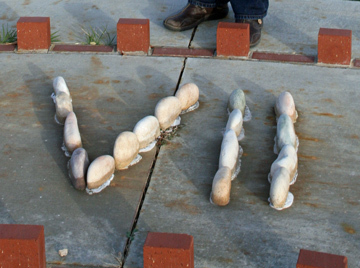 Dodge City was the first Kansas city to receive a portion of the World Trade Center ruins. A four-foot section of steel is placed under a U.S. flag and between replicas of the twin towers. A rock from the crash site at Shanksville, PA is also in Liberty Garden on the east side of Hoover Pavilion. We're going to every town in the state to research for a guidebook. We want to share some information with you now! This is a project of the Kansas Sampler Foundation. Buffalo Bill Cultural Center is now open in Oakley! Hey, need a place for a meeting in northwest Kansas? Or, maybe you just want to stop for visitor information. In either case, this newly-constructed first-class facility is now open! Dennis Schiel designed and painted this beautiful State of Kansas Historical Mural. Pictured here is one section but the entire mural is on the wall in the cultural center lobby. You'll find a pleasing and cozy lobby, a gift shop, and meeting rooms with all the latest in technology. 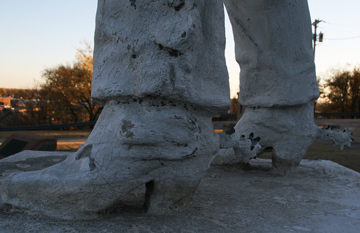 It is located right next to the double-life sized Buffalo Bill and buffalo statue. On Friday night, WenDee and I presented a program in Iola about the "8 Wonders of Kansas" at the Bowlus Fine Arts Center. We had an interested and receptive audience and enjoyed sharing some of the 8 Wonders and the behind-the-scenes story of photographing the book. The next day we got to do another program at the Family Reading Festival in Iola and autograph some books. We always try to find something new when in a town and this time we found a new "old" cemetery! This one, across from Allen Community College on North Cottonwood, had a memorial that looked like a mini Washington Monument!